A Fife community stalwart with multiple sclerosis (MS) has been left stranded miles from home because no care at home has been arranged for her. Mary Ednie, who has endured the progressive form of MS for 21 years, feels she has been “put in a box on a shelf and forgotten about”. 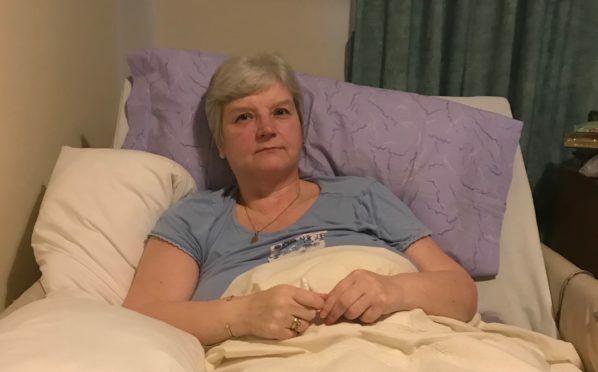 The 56-year-old from Kelty now needs a wheelchair and felt she had “no option” but to be admitted to Pitlair House in Bow of Fife two days before Christmas when her home care package was withdrawn. Mrs Ednie said she was told her home care could not continue due to her “critical needs” but Fife Health and Social Care Partnership could not confirm this due to patient confidentiality. Missing out on the festive season and loved ones’ birthday celebrations, she hoped the stay might be short but three months on, she is isolated, “in the back of beyond” and yearning for the day she will be able to return home. Mrs Ednie is also worried about the long journeys her family make, on country roads through wintry nights. “I do not expect my children to live through MS. It is me who has got MS,” she said. Mid Scotland and Fife Labour MSP Alex Rowley has condemned her tragic case as a failure of Fife Health and Social Care Partnership to organise a suitable care package. “Mary is clear that both the care she had been getting when she did have a care package at home and the care and support being provided by the care staff in the nursing home is first class. Fife Health and Social Care Partnership said it was wholly committed to supporting people to live in their own homes as far as possible. Divisional general manager Julie Paterson confirmed social work had been working with Mrs Ednie to provide a service acceptable to her. “We continue to work in partnership and hope that an agreed arrangement will be in place at the earliest opportunity,” she added.